.This is located on the slopes of Naksan mountain (낙산) midway between Sokcho-city(속초 )and Yangyang-gun(양양) and mid-spot between Seorak beach and Naksan beach also in the East coast of South Korea. Naksan means the place where the Buddhist Goddess of Mercy(Gwanseum bosal;관세음보살) stay. The goddess of mercy is so familiar with the human that she help them comfortable and happy according to the record of Buddhism. Naksansa temple(낙산사) was built in AD 671 by great master Uisang-daesa who was a priest of high virtue and studied in China of ancient Dang kingdom and also famous master in the China at that time. After return from China and arrived at here, he got treasures of Buddhist prayer beads made of crystal and magic dazzling pearl. And he received a divine revelation about the site of temple after the praying of 27 days. Through the long time this temple had been several procedures of reconstruction and expanding due to severe damage by fire, foreign invasions and the Korean war(1950-1953). Regretfully, the biggest damage of this temple recently that almost parts of one and treasures being destroyed was done by the fire in the spring of 2005. This one was restored through historical research and reopened to the public in 2007 by the efforts and donations of all across the nations’ Buddhists. Fortunately, Hongreonam hermitage, Uisangdae pavilion and Haesugwaneumsang statue did avoid the misfortune of the big fire in 2005. Uisangdae pavilion(의상대) is the place that Zen master UIsang-daesa(의상대사) sat and meditated. Monk Manhae reconstructed this pavilion to honor the Zen master Uisang as the shape of present in 1925(about 90 years ago) on top of the cliff by the sea. This has renowned for blending harmony with surrounding sea pines, the steep coastal cliff and the East Sea. This is the particularly famous for superb impressive attractions with the scenery of sun-rising. So many poets and writers wrote poems and left their records of beautiful sightseeing for a long time. Hongreonam hermitage (홍련암), red lotus hermitage in the literary meaning, was named after that Zen master Uisang-daesa(의상대사) saw the Buddhist Goddess of Mercy standing on the red lotus, was built above on the stone cave in AD 676(almost 1300 years ago). There is a 10-centimeters hall in the floor that people can see the waves by peeping through the hall, It is located on a cliff at the edge of east coast. 15 meters(49 feet) of the height, 700 tons of white granite statue, over-looking the southeast sea, built in 1977, the biggest Buddhist statue among the same sorts at that time, although the short history this Haesugwanemsang(해수관음상; Bodhisattva of Mercy) was adding the meaning to the people with her warm great image. The pond in front of this statue had many coins wishing fortunes. So many wishes as many as coins. This area was left nothing on the right side of this mountain filled with just black burned land by fire since few years ago. To see the new-born greens was very delightful thing after big tragic fire. Now it was keep going to recover their natural life fortunately. I felt the greatness of time and nature. No fire again, please. 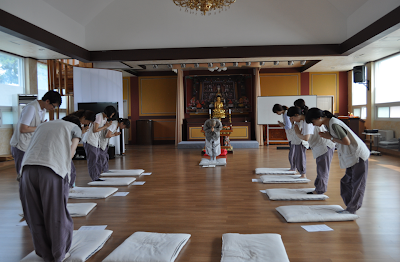 Naksansa temple operates various program of temple stay that gives people the temple life, Buddhist culture, experience a temple food, Korean traditional tea culture and attempt to look over ones' mind. There website is consisted on Korean language only as follow. >>click here !! It is better to sending your questions or application to their e-mail address stated on their official home page.